Everyday I have the privilege of sharing booting tips and tricks with hoof care professionals across the country. If you have not heard about wool socks with long term booting I am probably about to change your world. If you have a founder or other long term booting need, a couple pair of wool socks added to your booting protocol could greatly reduce the work involved in the rehab situation. Leslie Carrig of High Desert Hoof Care is a big sock advocate. 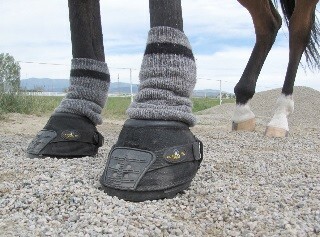 Here is what she has to say about using socks in conjunction with hoof boots. "Buy a good quality hiking sock which has a double layer of material. 100% wool is not a necessity. 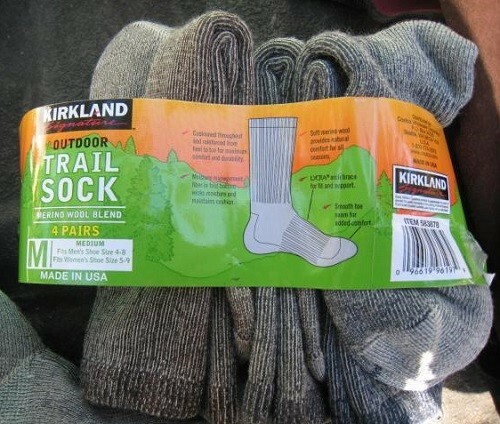 These socks are designed to prevent rubbing on hikers, because the friction occurs between the two layers of material. They can be purchased in the winter at any outdoors store or Costco. 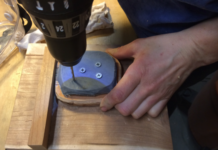 I do not cut the toe off and will say getting them on a really wide hoof can be challenging. I've found cutting off the top of the sock where it is gathered can help with this. I personally recommend that clients have two pairs and change them every day so they can let them dry out and wash as needed. Rehab booting requires a bit of extra diligence. 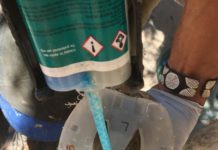 Besides preventing any chance of rubbing with these usually less than ideal feet, the socks help to wick moisture from the hoof and keep the environment clean and dry inside." The photos below show Leslie Carrig setting a horse up with socks and Old Mac's G2. 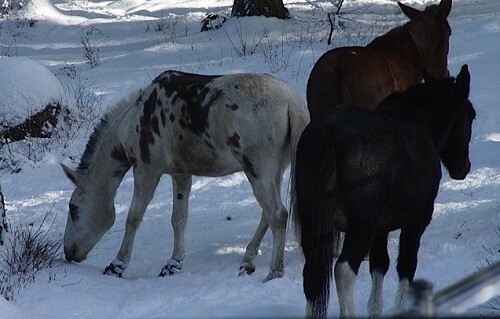 I received a 911 call from hoof care practitioner Barb Taylor out in Clayton, WA. 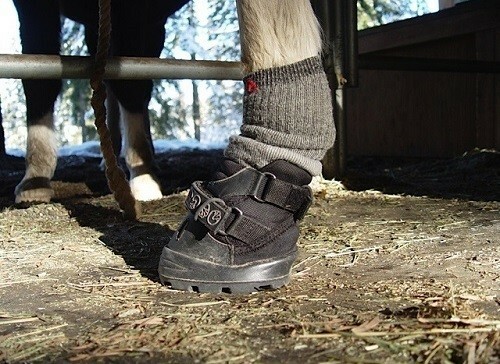 One of her mules, Grace was going through a metabolic situation and needed additional boots ASAP. We discussed the Easyboot Rx for her immediate needs as well as the new Easyboot Transition for her larger turnout. Her mule currently was in a pair of Easyboot Trails with Comfort Pads that were working well but Barb wanted to cover her bases. In the course of the conversation I mentioned that she might find the socks helpful especially since it had been wet and snowy. She liked the idea and indeed found them to be helpful. During the next few weeks I continued to receive positive updates on Grace. "Hey Debbie, Grace is doing great! She is sporting her Transition boots and wool socks! Those socks are life savers. No stuff to clean out of the boots and the hoof stays clean and dry. 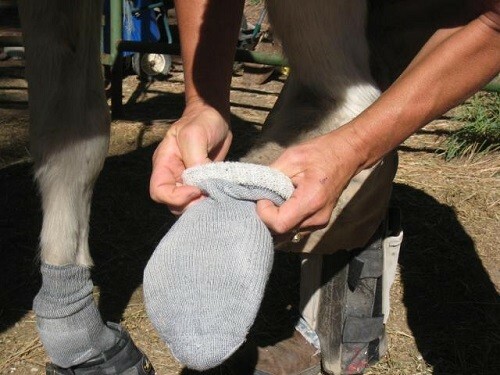 Occasionally I will sprinkle some No Thrush down inside the socks or dust on the hoof before reapplying the socks. The Transitions are working out nicely for the pasture turnout time. I sure don’t think I have to worry about one coming off. They are a nice light support boot, very secure and she is very careful when she gets around the icy spots. She is moving out nice in them so the break over seems good for her. The Rx boots were also the ticket. They fit perfectly with the wool sock. Once she wore them a day or two they pretty much molded to the foot. I added the pads as we discussed and marked the right boot to make sure she got the same molded pad back on the same foot. Way better than trying to deal with the heavy Soft-Rides. Grace is spending more time barefoot while in her small corral on the pea gravel. I have everything dialed in and can cycle through Trails and Rx boots for stall/corral time and Transitions for turnout. She has her own socks tagged with bright red embroidery thread so that we can tell her socks apart from my husbands socks when they go into the washer. I do think she might wear hers out a bit differently! I do like having both the Trail and the Rx boots. When you are booting longer than not it is really nice to be able to rotate the boots. If I hadn't already owned a set of Easyboot Trails I would have definitely wanted a second pair of Rx boots. This ensures I always have a clean dry pair ready to go. Ch'ears, Barb"
Thanks to all our professionals who serve the horse. Stay tuned for additional tips and tricks from the field.